There is a product on the local market in New Zealand called "Showerdome" that is a clear plastic dome that can be attached over the top of most open top showers. Covering the top of a shower reduces the convection air flow that naturally occurs when showering, as well as increasing the humidity while showering, which has the effect that one feels warmer and can turn the temperature down and reduce hot water use. It also heavily reduces the steam escaping the shower, so also heavily reduces condensation and associated mould problems in the bathroom. However, "Showerdomes" are quite expensive. Are there other designs or products available for achieving the same result? I suggest a square wooden frame with a pyramid-shaped frame rising from the corners. Fill the triangular sides of the pyramid with glass or "perspex". A bit of trig is needed to work out the angles. If you work with a bit more precision and use the perspex, you could dispense with the pyramid frame and just glue the panes together. The wooden base allows you to fit the cover snugly to the existing shower stall. As a first attempt, I would use a sheet of formica or equivalent brand. If you have an edge to work with, set it in place with a bead of caulk. Caulk is easier to remove if you don't like it. If you don't have an edge to work with, frame it with 1x2. Cut a triangle off of 1 edge of the 1x2 so that you 1/8" cut off the narrow dimension, and 3/8" off the wide dimension. Paint the frame with a good primer and exterior grade paint to protect the wood. Build the frame to suit, adding cross pieces if needed to keep the formica flat. Attach the frame to the formica using contact cement. carefully paint the edge of the formica. This is the only place where water can get into the layers. The triangle cutoff is on top (away from the formica, and on the outside. Set in place initially with duct tape on the bottom edge. Run a strip of masking tape even with the top of the wood. Run a another strip of tape on the narrow edge up to the triangular cut. Now put a bead of silicon seal along the missing triangle, smoothing with a wet finger. Remove the masking tape. Allow to cure. Remove the duct tape. Mask both edges of the bottom, about 1/4" from the edge. Repeat the silicon seal trick. Note: If this works, you may want to make a more solid version of it, and use the space above for storage. 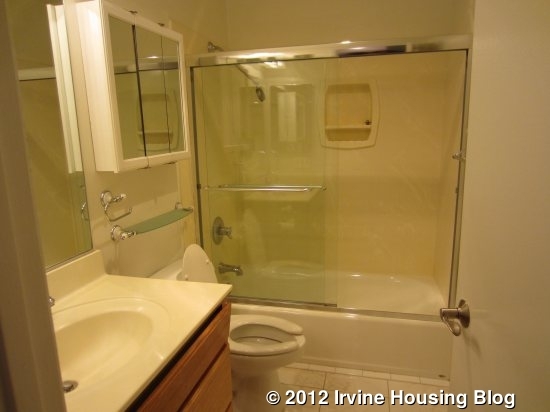 Since it's inside a house, a number of older homes in the US have closed in showers. It's either a set of shower doors that extend from the top of the tub where they are mounted all the way to the ceiling, or from the top of the tub to the bottom of a short wall extending from the ceiling. Something like this, but imagine from the top of the shower doors a wall going up to completely enclose the shower. Keep in mind that moisture issues can be problems, which is why most homes now use open-top showers. Not the answer you're looking for? Browse other questions tagged energy-efficiency water-heating or ask your own question.